New fabulous designers are popping up on the scene left and right and OneOneThree is no exception. The line is giving me the rocker look of Joan Jett crossed with more of the rocker "lady like" feel of Pat Benetar. In my head, this makes sense. 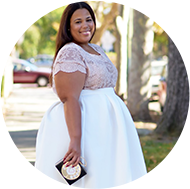 I first got a glimpse of this designer via The Curvy Fashionista. This line comes from a UK designer and they've only launched these teaser photos. My favorite piece is the black and white illusion dress. No word yet on the price points. Get updates on this line through Facebook & Twitter. OMG!! That white maxi with spikes and black maxi with the leather panel are dope!! I can't wait to hear more from and about them! I LOVE THE CAPE!! That's one TIMELESS piece! I like the blk/white dress and LOVE the red one! LOVE IT! I especially love the second dress.